Paper Monuments Project #022: Catholic Institution, the first community school dedicated to the education of children of color in the Deep South opened its doors in 1848 Funds for the creation of the school came from Marie Justine Couvent. Couvent was born in Africa, sold from the African coast, and sent to Haiti where she eventually gained her freedom. On January 29, 1858, student André Gregoire wrote the following in an assignment for his English class: “A man cannot do anything if he has no education to conduct himself in business; therefore, I make all my efforts to learn as soon as I can.” He profited in this, he said, from the dedication of his school masters: “for they teach me well and are very good to me.” André was a young free person of color living in New Orleans when it was illegal to teach enslaved children to read and write. And although the city had public schools, they only admitted white children. But because of the dedication of his community and the largesse of one woman, he had a school to attend and was taught very well indeed. André was enrolled at the Societé Catholique pour l’instruction des orphelins dans l’indigence, or Catholic Institution, the first community school dedicated to the education of children of color in the Deep South. It opened its doors in 1848 at the corner of today’s Touro and Dauphine Streets. Funds for the creation of the school came from Marie Justine Couvent. 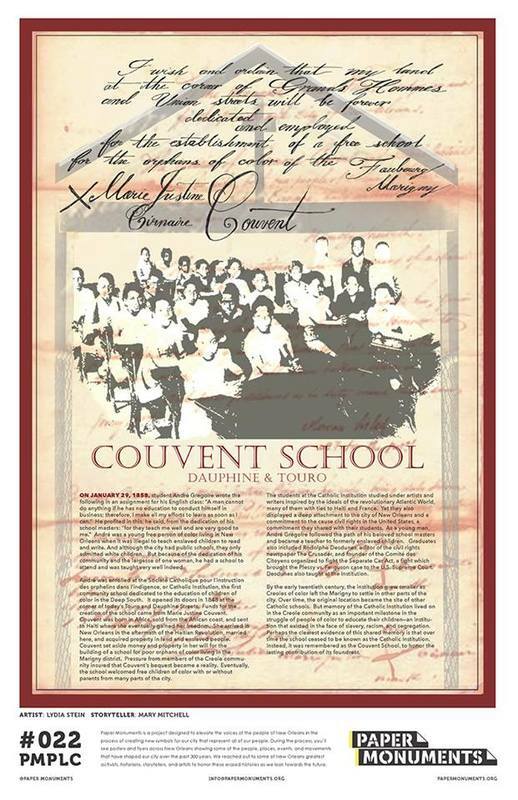 Couvent was born in Africa, sold from the African coast, and sent to Haiti where she eventually gained her freedom. She arrived in New Orleans in the aftermath of the Haitian Revolution, married here, and acquired property in land and enslaved people. Couvent set aside money and property in her will for the building of a school for poor orphans of color living in the Marigny district. Pressure from members of the Creole community insured that Couvent’s bequest became a reality. Eventually, the school welcomed free children of color with or without parents from many parts of the city. The students at the Catholic Institution studied under artists and writers inspired by the ideals of the revolutionary Atlantic World, many of them with ties to Haiti and France. Yet they also displayed a deep attachment to the city of New Orleans and a commitment to the cause civil rights in the United States, a commitment they shared with their students. As a young man, André Gregoire followed the path of his beloved school masters and became a teacher to formerly enslaved children. Graduates also included Rodolphe Desdunes, editor of the civil rights newspaper The Crusader, and founder of the Comité des Citoyens organized to fight the Separate Car Act, a fight which brought the Plessy vs. Ferguson case to the U.S. Supreme Court. Desdunes also taught at the Institution. By the early twentieth century, the institution grew smaller as Creoles of color left the Marigny to settle in other parts of the city. Over time, the original location became the site of other Catholic schools. 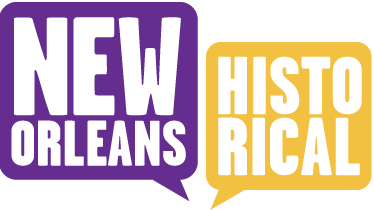 But memory of the Catholic Institution lived on in the Creole community as an important milestone in the struggle of people of color to educate their children—an institution that existed in the face of slavery, racism, and segregation. Perhaps the clearest evidence of this shared memory is that over time the school ceased to be known as the Catholic Institution. Instead, it was remembered as the Couvent School, to honor the lasting contribution of its foundress. Paper Monuments, Mary Niall Mitchell, narrative , and Lydia Stein, artwork, “Couvent School,” New Orleans Historical, accessed April 24, 2019, https://neworleanshistorical.org/items/show/1439.